One of the great pleasures of making Way of the Puck has been discovering air hockey’s unexpected—but far-reaching—influence in the arts, sciences, and popular culture. Air hockey won’t really go away; it’s connected to math and music and robotics and a hundred other disciplines. WOTP: Why did you decide to make Air? THIEN: I always describe it as an 80s movie. One of the inspirations for this was the arm wrestling movie, Over the Top. Air is about a guy whose dad was a pro air hockey player and got injured playing. So this guy, his son, was really good himself, but he kind of quit playing for various reasons—work and girlfriend being two of them. At the end he decides that doing what you love is the most important thing, so he decides to pursue air hockey again and actually plays his rival, the guy who injured his father. WOTP: So there’s a love interest? 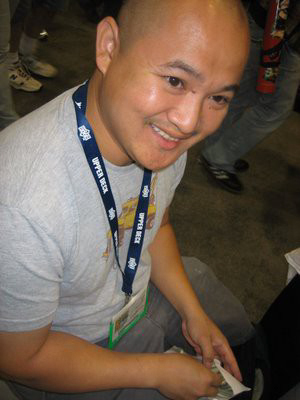 THIEN: Well, there’s an implied love interest. He plays with air hockey with another girl, and at that point they connect because they have this thing in common, but I think I just left it up in the air whether or not he’s actually in love. 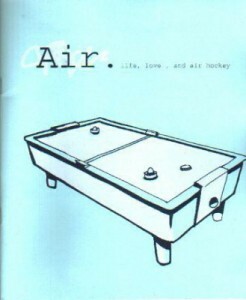 The love part is actually about air hockey itself, doing what you love. Not so much as falling in love with somebody. In the story one of the reasons why the guy quits air hockey is because his girlfriend thinks it’s a waste of time and that he should be out there making more money. It’s not a relationship that I’ve ever experienced but basically I was trying to play off the experience I’ve had with my parents—how they feel about comics and foosball… that it’s just child’s play and not a worthy activity. It’s also represents the perception people have about our little communities. I always imagine that people who are on the outside doing jobs, climbing up in business or whatever, would look at a community of air hockey players or minicomic artists and kind of say they are just wasting their time. But I think if you love doing it you shouldn’t stop. It’s the thing you should do. So that’s what the girl represents. 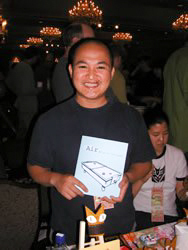 WOTP: What are some other similarities between minicomics and air hockey? That was so funny to me because all these little groups—these small communities—are really family oriented and think other groups (who are exactly the same) are weird. Just because it’s not an activity that they are used to! And I notice it’s not just air hockey or foosball or minicomics, but any type of mini- or small community has these same parallels, whether it’s racecars or bikes or skateboarding. It’s all about the same kinds of things. WOTP: So what is it that draws you to these activities? THIEN: I like the fact that it’s a small group of people doing something really specific and something that they really love. And the parallels are perfect. There are guys that are good and guys that aren’t so good but talk like they’re good. Just like in comics there are artists you respect, artists you hate, guys that do comics you can’t stand, in air hockey there are guys who have shots you don’t really like, or they just have an annoying playing style, or whatever. WOTP: Has there been any response from the air hockey community? THIEN: My favorite things ever have been the emails I got from air hockey players. It’s my favorite fan mail, by far. I never thought for a million years that any people who played pro air hockey would read this comic. But then I was also kind of worried that real air hockey players would be like, “Dude, you didn’t get that right. Or that’s not right.” But they’ve been really really nice and supportive of the book. I was planning on doing another one, a follow-up, because a lot of people have been asking me. So if I ever do that I’ll get all of the air hockey details dead on! Here are some awesome Thien Pham links, if you are interested! Please visit the Way of the Puck Facebook page and become a fan!